What is Mr. Herzher's Wicker Litter Box Cover? Mr. Herzher's Wicker Litter Box Cover is a decorative litter box cover that hides your cat's unsightly litter box. It includes an interior catch tray that eliminates litter messes that your cat makes when digging. It also has non-slip feet to protect your floors from scratches. It comes in dark brown to match most home decor. 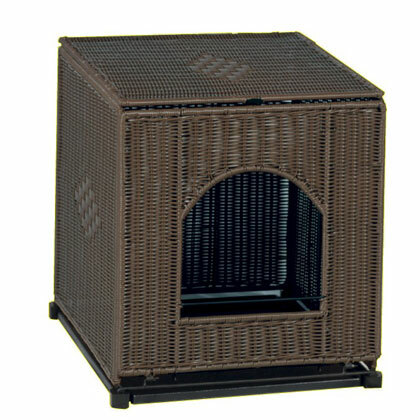 Mr.Herzher's Wicker Litter Box Cover comes in 2 different sizes to fit most cat litter boxes, and a dark brown Rhino-wicker that looks great in most homes. The Rhino-wicker doesn't absorb any odors or liquid, so it stays nice and fresh. The front panel opens and drops down and has glide rails to slide your cat's litter box in and out quickly and easily. The inside and outside can be easily cleaned with soap and water. Non-slip feet keep the litter box cover in one place while also protecting your floors. When your cat is digging and kicking out kitty litter, the interior tray catches any on the bottom and the cover stops the litter from spreading all over your home. Detach the top latch of the front panel and open Mr. Herzher's Wicker Litter Box Cover. Fill your cat's litter box and place inside. Then relatch the top panel to the rest of the litter box cover. To Clean: Complete the top step, clean your cat's dirty litter, wipe down with soap and water and relatch the top. Show your cat where his or her litter box is when you place it inside the wicker litter box cover. Measure your cat's litter box to make sure the litter box cover will fit comfortably inside the wicker litter box cover. You can easily clean the inside of the litter box cover with soap and water. It comes in two sizes that fit most litter boxes, large and jumbo.